Street vending is illegal — and common — in Los Angeles. AICP's Community Planning Workshop on Saturday morning explored issues around street vending in the city with a focus on the Boyle Heights neighborhood in East Los Angeles. Recent crackdowns from police on this activity have given traction to community groups lobbying for change. The local host committee for the 2012 National Planning Conference teamed up with Leadership in Urban Renewal Now (LURN), a local community organization, to run the Community Planning Workshop. Other partners, such as East Los Angeles Community Corporation (ELACC), and community members came to participate in the day's activities. Participating planners left the convention center for a bus tour of Boyle Heights, which lies just east of downtown L.A. across the L.A. River. The group entered Boyle Heights and took in the details of the neighborhood, such as the active commercial corridors of Cesar Chavez Boulevard. The tour guides from LURN pointed out the lack of green space and educational institutions in an area crisscrossed and bound by many freeway interchanges. Participants saw the variety of housing and the land use patterns hat shape this community of 100,000 residents. The bus tour ended at Mariachi Plaza, a public plaza adjacent to the new Gold Line Metro station. 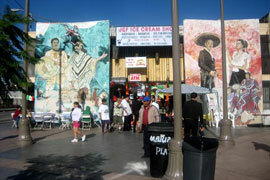 The area has been historically used by mariachis as a meeting place to obtain work, and has become the gateway to Boyle Heights. ELACC showed its nearly complete Boyle Hotel development, a historic preservation and affordable housing project which plans to open in July 2012. The group walked to Self Help Graphics, a neighborhood institution that provides space for artists, to begin the workshop. LURN set the stage for the day's activities by providing the background and goals for the workshop. While street vending is illegal in Los Angeles, it is nonetheless an integral part of communities around the city, and especially Boyle Heights. As the area begins to experience gentrification pressures from the recent opening of the Metro station, certain small business owners are looking to "clean the streets," essentially shutting down this viable economic activity. Boyle Heights is also a community lacking in fresh produce for its residents, and the goals for the day were to look for a solution to these problems. What kind of policy can be implemented to benefit the community, not clash with established businesses, and provide healthy food options for residents? "Many urban neighborhoods throughout the United States suffer from a lack of healthy food choices. The Boyle Heights neighborhood of Los Angeles is no exception. The largely Latino community has access to few affordable healthy food choices. The City of Los Angeles prohibits street vendors and therefore limits one option for providing affordable healthy and easily accessible food choices for its urban neighborhoods such as Boyle Heights. The 2012 Community Planning Workshop — Green Carts in Boyle Heights — is designed to address this issue head on, with participation from local community leaders and advocates. The Green Cart Initiative is an exciting grass roots effort to legalize street vending and find ways to engage vendors in fighting food deserts. Leadership for Urban Renewal Now (LURN) is leading an effort underway to change these conditions and provide opportunities for healthy and affordable food choices within the community. The Workshop is intended to develop practical "on-the-ground" strategies to provide healthy food cart vending options and overcome legislative obstacles while engaging residents in the process."